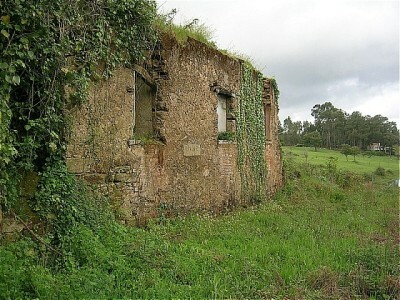 A ruined stone cottage with 10,250 square metres of land for sale near Ferreira do Zêzere in central Portugal. The ruin is not connected to either mains water or electricity and does require full planning consent from the local council to be reconstructed. The property is situated in a quiet location and is accessed via a gravel road. The property’s land, is all relatively flat and has a large variety of mature cork oak and olive trees and grape vines. The property has good, open views across the countryside and is not close to any other properties, though is only a short drive to the central Portugal town of Ferreira do Zêzere. The property does have a well on the land for irrigation purposes and mains water and electricity are approximately 200 metres from the boundary of the property. The property is fenced and could with planning permission be converted into a large country hide away. The property though in a country location is only five kilometres from the town of Ferreira do Zêzere. Ferreira do Zêzere is has a range of cafes, supermarket, shops, restaurants, banks, pharmacy, health centre, municipal sports centre and builders’ merchants. The historic town of Tomar, which is home to the UNESCO listed Convento do Cristo, is around 16 kilometres away. Tomar has a range of supermarkets, shops, restaurants, cafes, boutiques, builders’ merchants and banks. The closest airport to the property is situated at Lisbon, which is 132 kilometres by car. Lisbon airport is serviced by a variety of low cost airlines, which operate regular flights into and out of the United Kingdom and other European countries.